A fanciful color palette and whimsical subject give Iron Stop's Animated Dragonfly Wind Spinner a delightfully wistful kind of appeal. Glittering with royal purple edges, emerald accents, and a rounded silhouette that hints at the shape of graceful wings. The beautiful spinner suggests to all who pass to remember magical times of childhood and moments of good memories with nature surrounding a pleasant day. against the backdrop of an ancient forest, a glistening pond harbors the perfect habitat for exquisite lily pads, rose-colored flowers, and--best of all--a grandiose sapphire-blue dragonfly governing gracefully over its opulent native home. 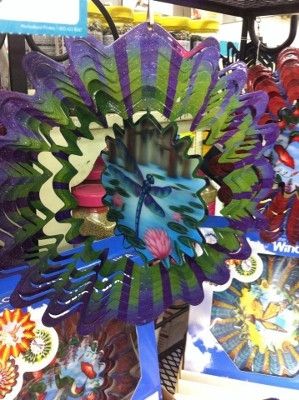 The decorative wind spinner provides a dramatic addition to flower and vegetable beds, manicured lawns, and wildflower refuges. It also offers a delightful way to greet guests on the front porch, to offer sparkle near a swimming pool, or to add a splash of color to the patio--no matter the season. 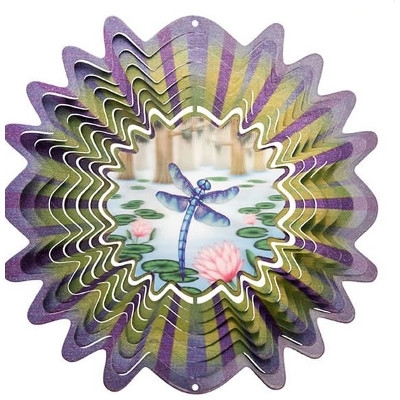 The wind spinner works well indoors too, bringing a charming touch of the outdoors to kitchens, living rooms, and reading nooks, or even a child's bedroom--the mesmerizing effect will spark interest and hold their attention. Sun-drenched during the day or twinkling in the moonlight, the wind spinner makes any space more spellbinding.